Do you love old buildings? How about uber old buildings with some great history to them? Not quite enough to pique your interest? What if I told you that this building has a very spiritual element to it? Would a grand cathedral housing major works of art interest you? Whether you are a prayerful history buff, a fine art lover, or just a person who enjoys seeing some choice architecture, the Cologne Cathedral in Cologne, Germany will not disappoint. 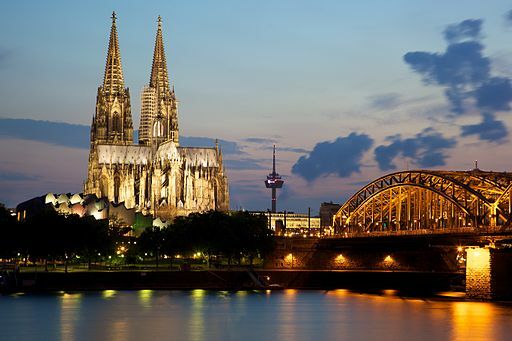 According to the cathedral’s website, the land that the current cathedral sits on has been a gathering place for Christians living in the Cologne area since the late Roman times. Although the exact number of churches that have been built on the land is not known, we do know that each of the structures built on this land has been larger than its predecessors. The Carolingian Cathedral, which was completed around the year 800, is the fist of these buildings that we know what it looked like. In 1164, the earthly remains of the “Holy Three Kings” were transported from Milan, Italy to the cathedral, which had become the official church of the Cologne archbishop. From approximately 1190 to 1220, several artisans began work on a shrine for the remains. Completed around 1225, the “Shrine of the Three Holy Kings” is the largest, and arguably, the most artistically significant relic of the middle ages. Due to the churches importance in the diocese, the shrine, and the steady stream of pilgrims making their way to the cathedral, it was decided that the building needed to undergo a major facelift. The old building was torn apart step by step during which the old structure burned to the ground. Construction on the new Gothic cathedral began in 1248. Over the years, the Cologne Cathedral received several more additions and restorations. It has even survived the ravages of war. In 1794, troops from the French Revolution marched into Cologne and took over the cathedral – using it for numerous things, including a warehouse. It was not consecrated again as a church until 1801. The cathedral even underwent years of restoration after being hit by 14 aerial bombs during World War II. In addition to the Shrine of the Three Holy Kings, the Cologne Cathedral is home to some other super sweet relics. Upon visiting the cathedral, you can see the oldest monumental sculpture of Christ’s crucifixion still in existence – the “Gero Crucifix.” After touring the cathedral’s many tombs and monuments, you may want to spend some time with the “Milan Madonna.” Although the original wood carving was lost in during the cathedral fire of the mid-13th century, the replacement is thought to have been made around the year 1280 and is said to have miraculous powers. Then it is time to soak in the ambience of this massive Gothic building, enjoying the giant windows and stunning architecture. No trip to the Cologne Cathedral would be complete without spending enough time to hear the beautiful cathedral bells in person. The Cologne Cathedral is truly a work of art all its own. No matter if you are looking to make a spiritual pilgrimage or a cultural retreat, the Cologne Cathedral is simply one place travelers to western Germany can not miss.